The Father by Florian Zeller, directed by Ted Dykstra and Oyin Oladejo, is a brave close look at aging, specifically with Alzheimer’s Disease. The title character, known as André (Eric Peterson), demonstrates with great accuracy several key characteristic of living with dementia. Further, Peterson’s interpretation of the progression of some of these characteristics is carefully delivered. While his physical abilities may change minimally throughout the play, we see a lot of behavioral and cognitive changes. Beyond the more commonly noted ones such as memory loss and repetition, we notice things like physical outbursts, confusion, mood changes, and hiding of possessions. The latter become a theme in the show as André’s watch is supposedly misplaced in several scenes or stashed in a secret cupboard, despite his convincing claims it has been stolen. As an audience member we want to believe his version of the facts: that his caretaker is a thief. After all, he is so charming and innocent most of the time, why would he lie? And this is what the show does: it forces us to question our own biases about how we treat ageing members of society. Anne (Trish Fagan) is the daughter who must navigate this rocky territory and Fagan handles the confusion, stress and heartache of helping to take care of a parent, with as much attention to detail as Peterson does. Sometimes she rises to the challenge with determination to do right by her loved one, and sometimes she is so exhausted by it, barely capable of plummeting into a chair with a glass of wine. I partly chose this production because of my proximity to the health field and experience working with older adults, but as serious and realistic as the above sounds, the play falls into the dark comedy genre. In true farcical style, various actors step into the roles of caretaker, Anne’s partner, and even Anne herself. 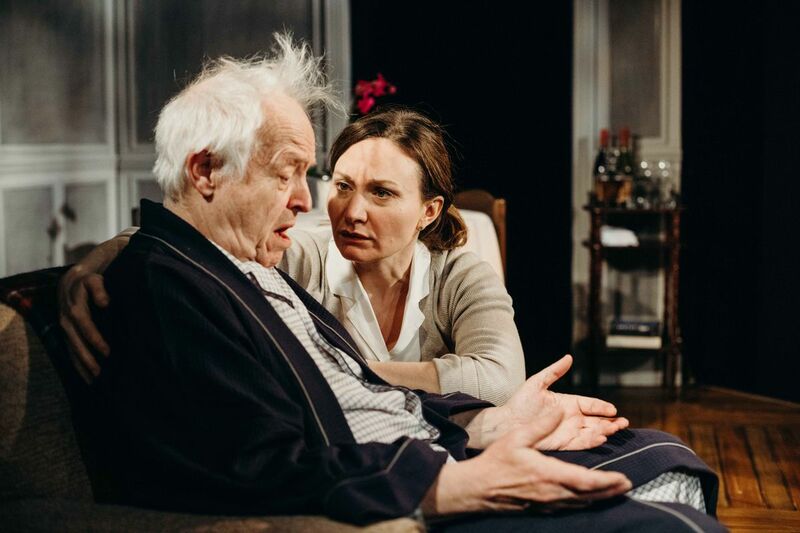 Dementia is the perfect foil for a man who cannot seem to distinguish between Anne’s boyfriend and ex-husband, or the care worker he met yesterday versus today. The actor swapping would be funnier if only it were not such a heartbreaking illness to cope with. In fact, the comedic value seemed to be completely lost on the audience by the second half. However, I believe we have lots to gain from being immersed in this world. For now, just being present in it might be a good start. After all, the World Health Organization claims there will soon be 1.2 billion people alive over the age of 60. With Statistic Canada predicting that over 40% of the Canadian population will be over 50 by 2026 and research showing early onset dementia is on the rise, we will need more shows like this to help us emotionally navigate certain aspects of getting older, for ourselves and others. After all, the theatre is meant to be a reflection of our society and when was the last time you saw a play with someone living through any cause of dementia, let alone Alzheimer’s Disease?